The following topics describe and show details of the measure-related views that are available as drill-down options. Note: In reports that show aggregated measures, measure data might be distinctly counted. This means that items, such as staff, tools, or machinery that moves from location to location are not counted twice when totaling at higher levels. When you click an Objective drill-down hyperlink and select Show Measures (Curr vs. Prev), the drill down takes you to the Show Measures view, which displays the heading Measures - Compare to Previous. In this view, current measures (Percent Reached, Target, Actual) are compared to previous measures for the selected objective, as shown in the following image. This view compares data for current and previous time periods which can be year over year, quarter over quarter, or month to previous month depending on the time window that is configured. PMF also provides measures for the previous year total, same quarter in previous year, and same month in previous year. From the Show Measures view, you can select the Measure Details drill-down option in any of the columns displaying Current and Previous data. This option takes you to another view that provides statistical data at the lowest atomic measure level for the related metric. For details, see Measure Details. The Show Measures view also enables you to drill into the properties for any item in the Measure column to display additional views that show how the measure was loaded, what calculations were used to create it, and so on. To display additional data related to a measure, click a hyperlinked item in the Measure column and select the desired option. For a list of the available drill-down options, see Default Measure Drill-Down Options. When you click a measure drill-down hyperlink, for example, in the Show Measures view, and select Measure Details, the drill down takes you to Measure Detail Data. Clicking a measure in this views view provides statistical data at the lowest atomic measure level for the related metric, as shown in the following image. From Measure Detail Data, you have access to different dimensional cross-drill data views by clicking a hyperlink in the first column and selecting from the drill-down options. The options vary, depending on how your own dimensions are set up. Show by Month. The view is reformatted to show data by month. Show by Location. The view is reformatted to show data by location. Show by Product. The view is reformatted to show data by product. Show by Organization. The view is reformatted to show data by organization. When you click a measure drill-down hyperlink and select Measure Breakout, the drill down takes you to the Measure Breakout view. This view provides actual, target, and percent reached measure data with graphs displaying current period and year-to-date trends for actual, target, and prior year performance. You can also view additional measure properties in a pop-over panel by clicking the zoom button in the upper-right corner of the view. 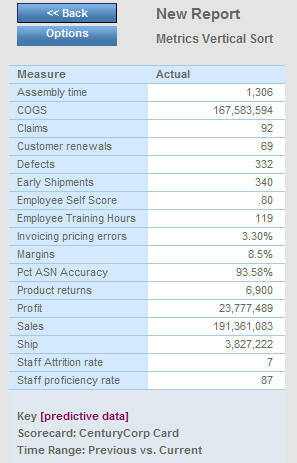 An example of the Measure Breakout view for the Sales measure is shown in the following image. A Measure Breakout view is also available in PDF format for print output in the Analytics tab. To access it, select Analysis or Measures Detail from the Type drop-down menu, select Measure Breakout Booklet - PDF from the View drop-down menu. When you click a drill-down hyperlink and select Operational Report, the drill down takes you to the view that was set up by your administrator, as shown in the following image. For any project, process, objective, or measure, your administrator can set up a WebFOCUS report as your operational report. This enables you to link PMF to external reports.